Gearing up for Amarettos 8th Bday! Hey everyone its your favorite Ava here! I mean I am your favorite right? LOL Speaking of favorites. Its time to pick yours! Well we are gearing up here at the ranch to celebrate Amarettos 8th Birthday! Can you believe it? I cant! We are so grateful for all of your support and love, Amaretto really is the best community of Second Life. So everyone knows a few things happen when Amaretto has a birthday! First is we have a massive party! 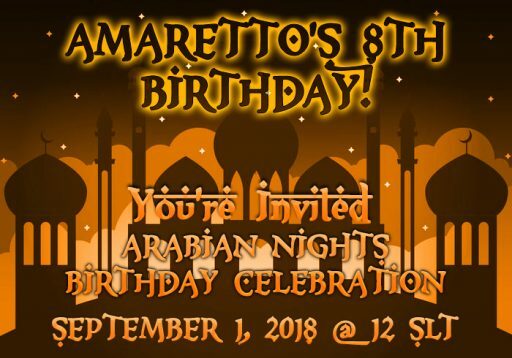 So here is us officially inviting you to Amarettos Arabian Nights 8th Birthday Celebration! The party details are still in the works, but we know this years festivities will be on September 1, 2018! I do happen to know we are going to have some very cool surprises to share with you guys! So clear you calendar and save the date Amaretto is turning 8! Just as in previous years we will host the 6th Annual Breeders Choice awards! So this is your chance to nominate your favorite, sim, breeder, auctioneer, collection and so much more to be recognized by Amaretto and the Community! I love the Breeders Choice Awards! If you have an idea for a new breeders choice award please send me a nc or shoot me a message with your suggestion! Now nominations will be open from today 8/2/2018 unti l 8/16/2018! You can nominate any one you think should be recognized! Amaretto will collect all nominations and take the top 5 then we will open voting on our website so that you guys can pick the winners after all these are the Breeders Choice Awards! 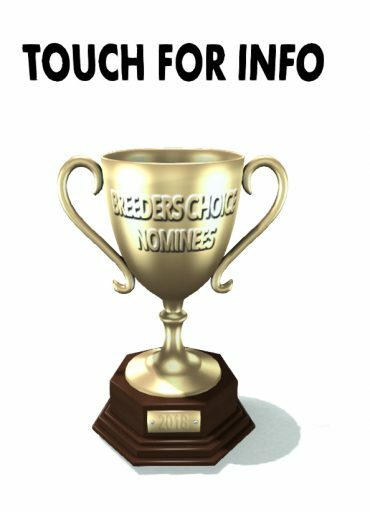 Here is how you can nominate someone for a Breeders Choice Awards! Create a notecard and copy/paste the categories with your breeder choice for each. When completed, drag the saved notecard from your inventory onto the suggestion box. Be sure to drop those notecards in the Trophy there is one located at every Amaretto location. Please only make your nominations once. If you have a question on how to nominate someone please ask me or any other Amaretto Staff Member! Happy Nominating everyone and Good Luck! I can’t wait to see who you guys pick!! This is Ava over and out!